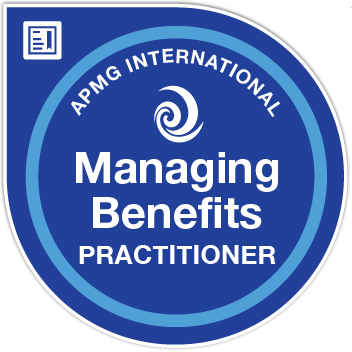 Badge holders have shown that they can plan the implementation of benefits management, select appropriate strategies to sustain and measure progress. They can select and adapt principles, practices and techniques to suit different environments and identifying activities that should be undertaken during each of the practices of the Benefits Management Cycle. They can evaluate examples of benefits management information (documents) and analyse the solutions adopted in relation to a given scenario. Badge holders have passed an objective testing multiple choice exam, scoring a minimum of 40 out of 80 (50%). The exam is an open book exam (Managing Benefits guide only) lasting 2.5 hours.